To mark the 75th year that the mint julep has been the official drink of the Kentucky Derby, Woodford Reserve – the official bourbon of the Kentucky Derby – is offering 75 special (read: pricey!) mint julep cups for sale. 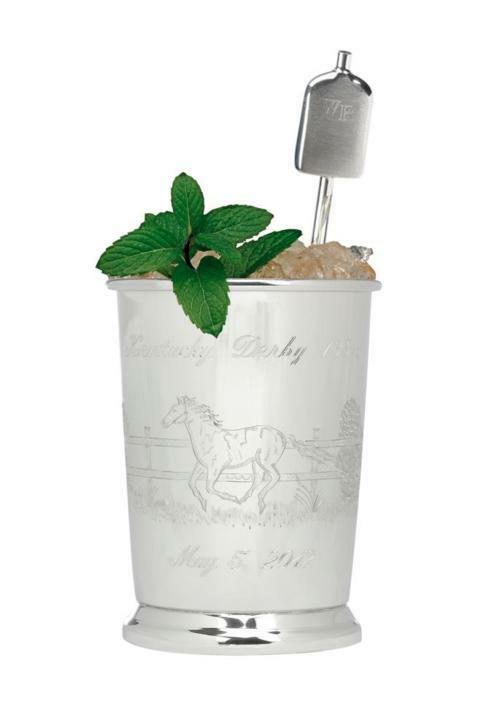 Through noon (EDT) on May 3, you may visit this site to purchase either the $1,000 “Traditional” cup, pictured above, or the $2,000 “Prestige” cup, which is made of sterling silver plated in 24 karat gold and features a horseshoe set with 43 diamonds equaling approximately one carat. Sixty-five Traditional and 10 Prestige cups will be sold. You must be present at the Kentucky Derby at Churchill Downs on May 5 to receive your cup, at which time you may enjoy a mint julep prepared with the new Woodford Reserve Double Oaked bourbon; water from Versailles, Kentucky, home of Woodford Reserve, and its namesake city in France; lemon mint from California and Kentucky spearmint; and Bourbon Mint-Julep and Bourbon Vanilla sugars from Louisville’s Bourbon Barrel Foods. All proceeds from sales of the Woodford Reserve $1,000 Mint Julep Cup benefit The Heart of a Horse Foundation, a California-based organization that conducts horse rescues and finds homes for retired sport horses.